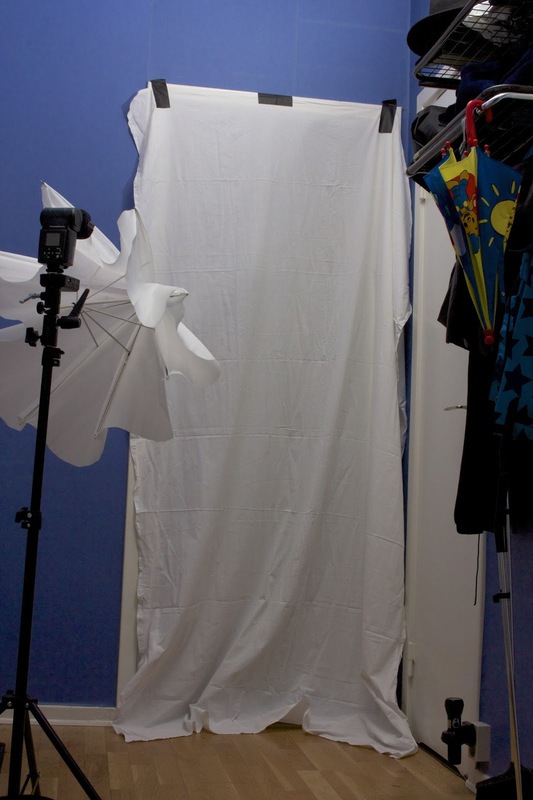 A bed sheet in a doorway makes a great softbox. I held a flash photo tutorial at the Lerum Photo Club earlier this evening. We had a wonderful evening shooting a live model, gorillas(! ), and dinosaurs(!!!). I was asked to model too, not because of my looks, but because of my hat. I did not have time to shoot anything myself during the workshop, so when I came home, I decided to do a noir style shot before going to bed. A bed sheet made an excellent diffuser. The softbox is the hallway. I used gaffer tape to fasten a bedsheet in my kitchen doorway. 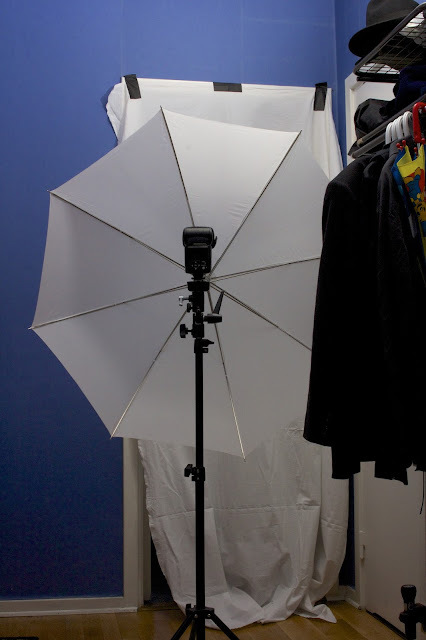 I put a flash and a white shoot through umbrella in the hallway. The idea was to get two layers of diffusion, first when the light from the flash goes through the umbrella, then when it hits the bedsheet. I put a 30 mm lens on my camera, mounted the camera on a Gorillapod, a small tripod, tilted it, and angled it upwards. I used a radio trigger to set off the flash. I used a shoot through umbrella as my first diffusion layer. This ensured that the light would spread evenly through the bed sheet. The same multilayer diffusion idea is used in many professional softboxes. I darkened the kitchen, put the flash on half strength, and ran a few test shots. The trick is to remember that you can darken the kitchen by reducing the exposure time, without affecting the flash pulse at all. then you can increase the aperture to make the light from the flash more intense. Of course, you can also increase or reduce the ISO setting to get the overall effect you want. In post, I used Aperture to increase the contrast a bit, and erase some reflexes from objects on the kitchen sink. I also cloned out a few tell-tale details on the toy gun. I bought it in a toy store, and if it is well lit, it does not look very dangerous at all. By shooting from a low angle and tilting the camera a bit, I made the silhouette in the doorway look large and threathening. This is a trick you often see in old movies. 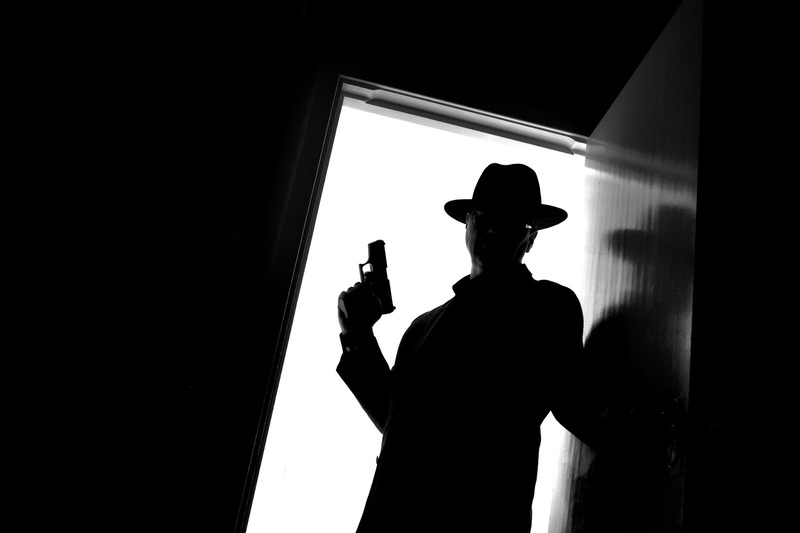 The hat and hiding the face in shadow also contributes to the feeling of danger. Easy, and fun, and one more thing I can bring back to the Horror Noir project. I also made a variant photo with my eyes lit. To do that, I needed a very narrow light modifier. I made it out of a pizza box. You can read about it here.